Israel Folau (Tongan: Isileli Folau) is an Australian professional rugby union footballer. He previously played rugby league and Australian rules football. 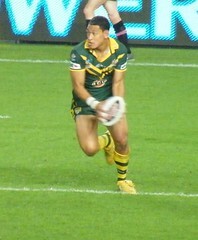 Israel was born in Minto, New South Wales, Australia, to Tongan parents, Amelia and Eni Folau. He is married to New Zealand netball player Maria Tuta’ia. His parents are devout Mormons (LDS). I hope he will not be sacked by Rugby Australia. Such a pity to not watch him at RWC or Rugby Championship. He is the son of Amelia and Eni Folau. His parents are devout Mormons. correction: Israel Folau (Tongan: Isileli Folau) is an Australian professional rugby union footballer. He previously played rugby league and Australian rules football.